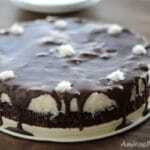 Chocolate Bounty Cake, is a delicious coconut cake that you’ll not want to miss. 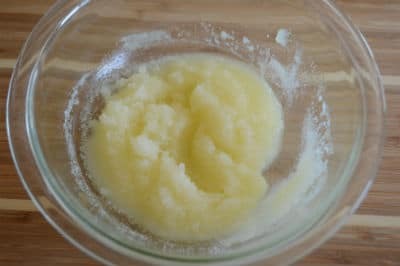 I’ve received a ton of positive feedback on this recipe so I am re-posting it today trying to encourage you all to try it. An absolute winner, trust me. The original post was published almost a year ago, but by digging deep in my folders, I have managed to put up a quick video for you to check. I hope you’ll give this a try soon. A delicious bounty cake recipe that tastes like the candy bar, dare I say even better . 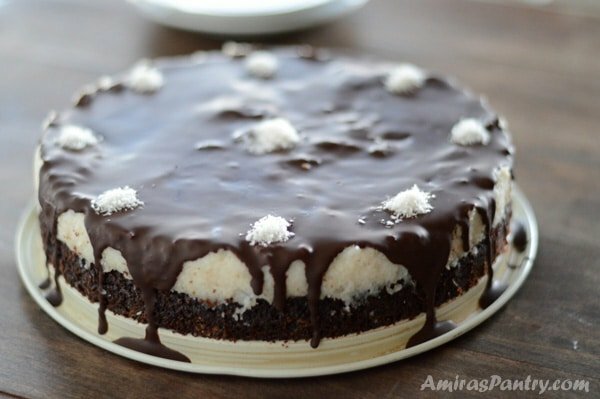 A pretty cake that delights all coconut and chocolate lovers. 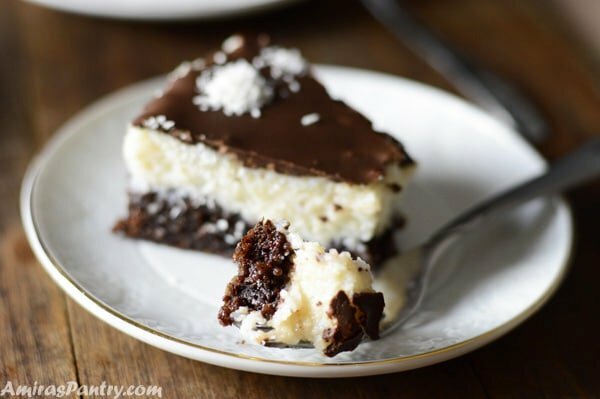 A layer of fantastic brownies, and yes I mean melt in your mouth kind of brownies, topped with a thick layer of sweet heavenly coconut and topped with your favorite chocolate- mine was dark. I took it to a gathering and everyone wanted the recipe, we went out to dine in a restaurant and they all asked me to bring the leftovers so they can have it after dinner in the restaurant , rude, I know. 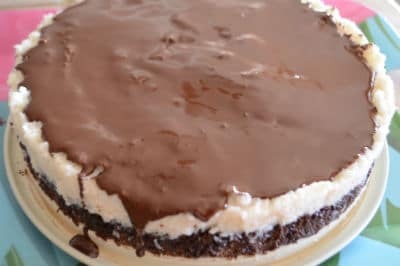 Bounty bars were my late dad’s favorite chocolate, bad thing that I did not know I can make such a delicious cake until he was not here anymore. When I was like 6 or 7 my dad used to go to Port Said in work missions and bring us lovely exported chocolate from there. Back in the late 70s, exported goods were not in every corner like these days, they were rare and if you wanted to get any of those fancy things, you’d have to go to Port Said and buy them then pay expensive taxes when you leave the city to head back to Cairo or practically anywhere in Egypt. Back then people used to go there buy expensive clothes, watches from reputable brands, you know like Marks & Spencer, Rolex,..etc. The funny thing is that I remember many people then used to wear 4-5 layers of clothes and may be 3 watches in each arm so they will not pay taxes as if these were their personal items, really very hilarious. Dad, pretty much used to bring us chocolate each time he went there for his work. He used to have lots of projects there in the reconstruction of Port Said after the Suez crisis or what we call the Tripartite Aggression. Each time he went there, I used to wait for him on pins and needles, of course for the chocolate . He used to buy expensive chocolates like Bounty, Toblerone and there was this raspberry filled chocolate that I do not remember the brand, this was my favorite although it was dark!! seems that this chocolate is behind my eternal love for dark chocolate. I did not like the Bounty until may be early high school, by then he used to go to work in KSA and he brought it from there, but anyways by that time, it was more common to see luxurious, exported goods in the stores. I am sure if he was still here he would have liked this cake a lot. So here is to my dad and every Bounty lover out there. 1/2 cup unsalted butter melted. 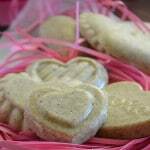 A dash of vanilla powder you can use extract as well. 2 cups unsweetened finely shredded coconut flakes. 4 oz dark chocolate bar. In a deep bowl, mix sugar and melted butter. 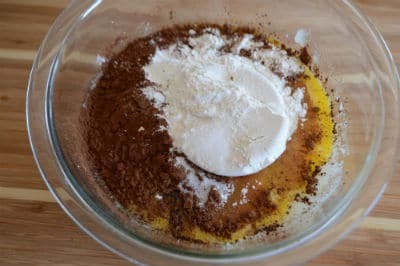 Add lightly beaten eggs, vanilla, cocoa powder salt, baking powder and flour. Mix with a wooden spoon just until the flour is all incorporated. Pour the batter in a 9 inch springform pan, bake for 25 minutes and do not overbake. Prepare the coconut layer, by melting the butter in a saucepan over medium heat, then add all the ingredients. Keep stirring until it is bubbly and thick. 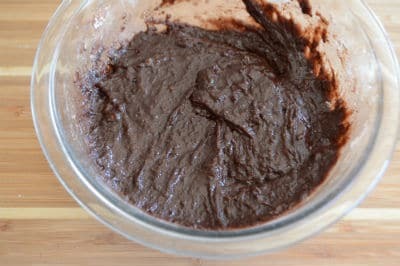 Let the brownies and the coconut mixture cool to room temperature, then pour the coconut mixture over the brownies. 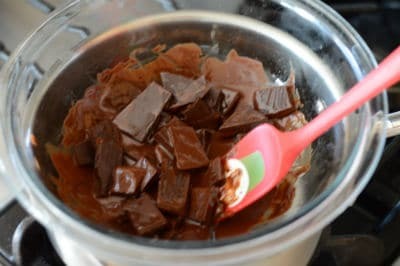 Melt the chocolate in a double broiler or the microwave until smooth. Pour the chocolate over the cake to cover the top and parts of the sides. These are neither "cake" brownies nor "fudge" brownies; they fall somewhere in between. So if you need one or the other then this brownies are not for you, you better use your own recipe and go on from there. 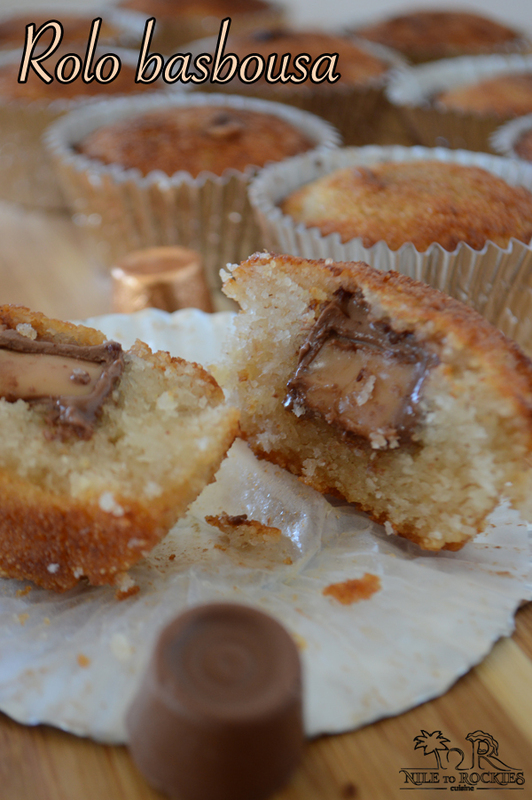 Do not use a mixer as we do not want the batter to be overmixed, a spoon is just enough for it. Need more desserts ? check out the desserts collection here. Made this a couple of time already and it is always a winner, everyone was very much pleased . Melissa, I am happy that you’ve liked it. Thank you for your feedback. 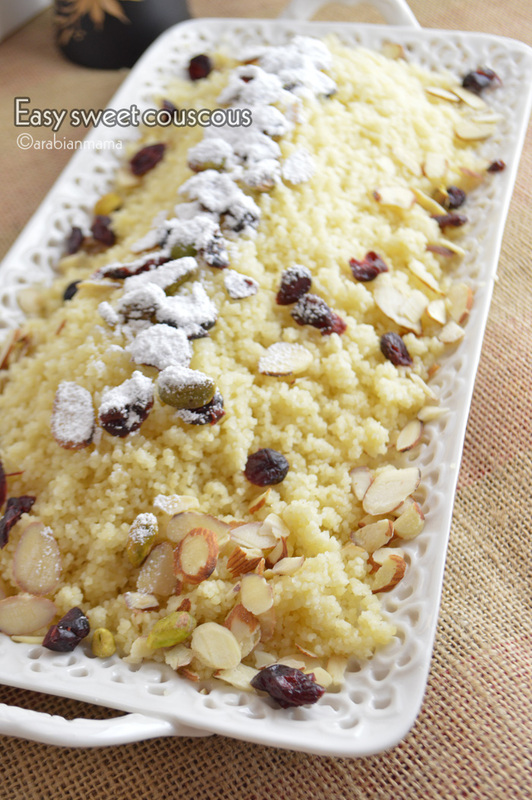 Can I substitute semolina with something else? What are the options? Kas, thanks for your interest in this recipe. 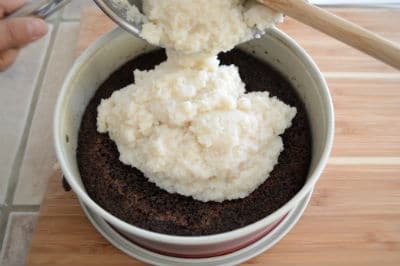 All-purpose flour, bread flour or wheat flour are recommended as subs for semolina , I recommend going for the whole wheat flour first if you can get a hold of it. This recipe is really so so tasty many of my readers tried it before and made my inbox shine . I made this about 3 times in last 2 months and everytime it’s a winner Alhumdulillah. JazakAllahu Khairan for this recipe. I have even tried ur other recipes and all have out brilliant. Egypt has a special place in my heart as my son was born there and I love Egyption people. Thank you so much Hina for those kind words. I am glad that you liked the recipes here. I hope you’ll tell me what other recipes you liked. The pin for this says “gluten free, vegan and paleo.” It is definitely not gluten-free or vegan. I don’t know about paleo. You may want to take another look at that. Otherwise, sounds delicious! Bounty Chocolate bars are my favorite- and to make a cake out of the ingredients would be absolute heaven! So glad you shared this recipe, Amira! It is a real heaven indeed for bounty lovers :). Thanks Fran I hope you’ll try it soon. Boookmarking this for a runnner up for my dec 24th dessert 🙂 I am not sure we even have Bounty in Canada so I always had some when we went south to the US. Oh, my gosh. This is my idea of heaven! I adore coconut desserts, and yours is a winner!! Neat cake. 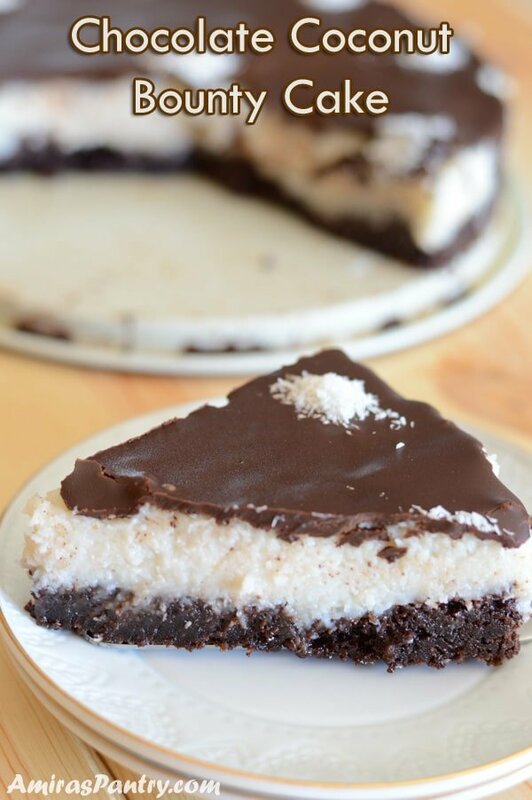 I love the combo of chocolate and coconut, so this is perfect for me. Thanks!